The letter talks about slavery and is signed by Harriet Beecher Stowe. A Los Angeles auction house Thursday put a historical item up for sale with Massachusetts ties: an 1852 letter that author and antislavery activist Harriet Beecher Stowe wrote from Andover. 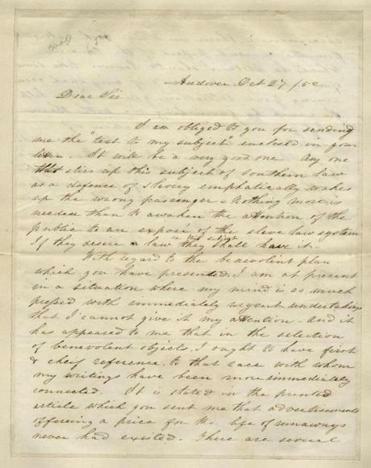 On its website, Nate D. Sanders Auctions said the letter, penned by Stowe on Oct. 27, 1852, was written at the height of the popularity of “Uncle Tom’s Cabin,” her novel chronicling the barbaric cruelty of American slavery. The Eagle-Tribune first reported on the auction. Bidding was set to end at 8 p.m. Thursday, with a minimum bid of $21,000 required to enter the fray. Prospective buyers can bid online. A first-edition printing of “Uncle Tom’s Cabin” was also available from the auction house, with a minimum bid of $20,000 required. The novel was serialized in the National Era, an abolitionist newspaper, in 1851-1852 and issued as a book in 1852. Its publication was an international sensation. “Uncle Tom’s Cabin” sold 10,000 copies the first week it rolled off the presses. In the first year, it sold 300,000 copies in the United States. In Britain, it sold 1.5 million in a single year. It was translated into 48 languages before Stowe’s death at 85 in 1896. Globe Correspondents Patricia Harris and David Lyon contributed to this report. Travis Andersen can be reached at travis.andersen@globe.com. Follow him on Twitter @TAGlobe.